Heart Rate Variability (HRV) is a term that describes many metrics and analysis techniques, including Time Domain, Frequency Domain, and Non-Linear Analysis. 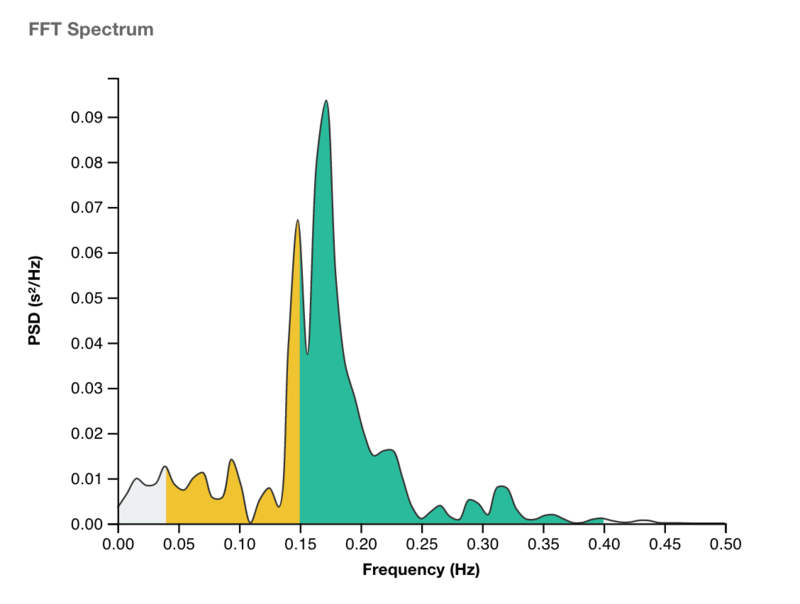 Frequency Domain Analysis is a complex analysis technique that shows how much of a signal lies within one or more frequency bands (ranges). With regards to Heart Rate Variability, research has identified certain frequency bands that tend to correlate with certain physiological phenomenon, such as Parasympathetic nervous system activity. LF/HF Ratio: A ratio of Low Frequency to High Frequency. Some consider this indicative of Sympathetic to Parasympathetic Autonomic Balance, but that is controversial. Please see this article and this article for more information. Note that obtaining accurate lower frequency measurements requires longer reading times (minimum 4 minutes or more). You may also have seen frequency values in Hertz (Hz) or milliseconds (ms) or milliseconds squared (ms 2). Hertz (Hz) refers to the frequency band or the location on the frequency band. For example, there may be frequency activity at 0.4 Hz. This tells you where in the frequency spectrum you are referring to. The actual activity in that band is typically expressed in terms of "power", which uses the units milliseconds squared (ms 2). For example, you might have 590 ms 2 of power in the 0.4hz frequency band (hypothetical example).